On a recent nostalgic visit to Bristol I picked up a copy of "Bishopston Matters" and saw the page relating to "The Gloucester Road Story". This interested me greatly for my mother and father moved with me from Sydenham Road to Derby Road in 1941. My brother and sister (twins) were born in the front room of No 14 on the 18th December 1941, a night I still remember although I was only 3 years 9 months old at the time. My mother was attended by a Dr. Rendell-Short and Nurse Millard. Incidentally my brother is DJ Derek, now aged 70 and something of a Bristol legend. My family remained at number 14 until my mother died in December 1975. Some years before this time my brother had purchased the house but sold it shortly afterwards. Thus as you can see I spent the whole of my childhood in Bishopston, not leaving until I went to teach in the Army Schools in Malta in 1964. As you can imagine I have a host of memories of the area. My mother’s family was a typical nuclear family of that period. My grandmother lived at 7 Melbourne Road and I was born in the front upstairs bedroom in 1938. My father had come from Wales to train as a carpenter at Remploy in Radnor Road and had met my mother because my Grandmother took in lodgers. My mother had two sisters; Audrey her younger sister and her husband lived at 13 Monk Road and had two girls; our cousins whom we played with as we got older. My mother’s older sister Iris lived with her husband at 17 Downend Road and had one daughter Pat. She was somewhat older than me and I did not see a lot of her but I remember she taught me how to play chess. Incidentally she later married Maurice Wilkins, a scientist who won the Nobel Prize with Crick and Watson for the discovery of DNA. My father was in the Army for the duration of the war and had compassionate leave in the period when my brother and sister were born. My mother had a fairly hard time bringing up the three of us during the war. One occasion, which although I was only five years old I well remember, was when the barrage balloon which was based in St Andrew’s Park came down in a storm. The cables were long enough for it to miss the big houses in Somerville Road and it came down on the roof of No.14 Derby. Of course it collapsed and lost all its gas but it smashed some windows and took tiles off the roof. My Mum must have thought we’d been bombed. The following morning I remember standing on chair looking out the window as a gang of WAAFs dragged yards of silver material through our house and rolled it all up into the back of a little van whilst my mother made endless cups of tea. The Gloucester Road featured hugely during my childhood. My first memory is of our family, with my father in his army uniform, going to one of the big houses just north of Berkeley Road – opposite Princes Place – and having our photograph taken by a portrait photographer who had a studio there. This would have been in 1944. Incidentally there was a men’s’ hairdresser operating in a sort of shed in Princes Place called Mr. Trigger. He later moved into possibly the same house on the Gloucester Road that the photographer had been in. Up to the age of about eight the main road was the boundary of my freedom in the neighbourhood. Out on my own I could go just about anywhere but I was forbidden to cross the "busy" Gloucester Road. This fact, of course, did not stop me using our side of the road. I suppose my real memories of my own usage of the shops started from about the age of eight (1945/46). Firstly I used to greatly enjoy the Saturday morning children’s shows at The Premier Cinema. On the other side of the road, after I was old enough to cross the road and cycle there, was an electrical shop called "Craddy’s", No 306. Here I used to take our radio accumulator to be charged every so often. Whilst it was being done Mr. Craddy would lend us another so we could keep on listening to our radio. Just south of Craddy’s, on a corner near the Church entrance was a shop which in recent years was Brandon Tool Hire – No 290. 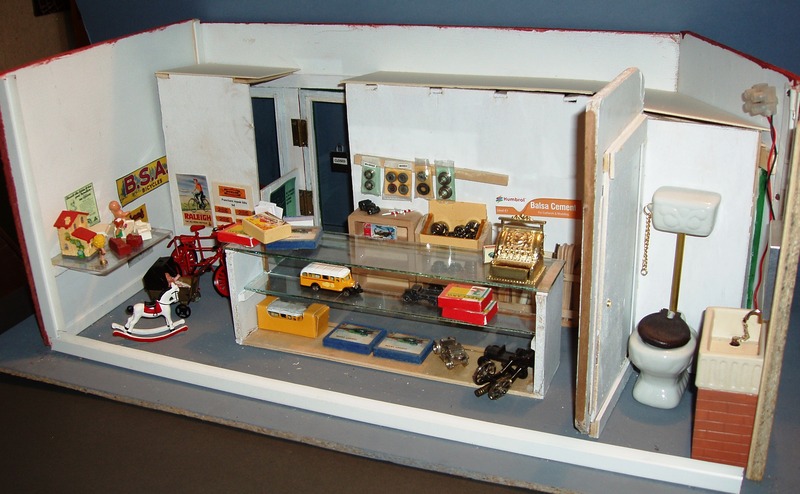 In the fifties however it was a magnet for us boys and we called it "The Aeroplane Shop". 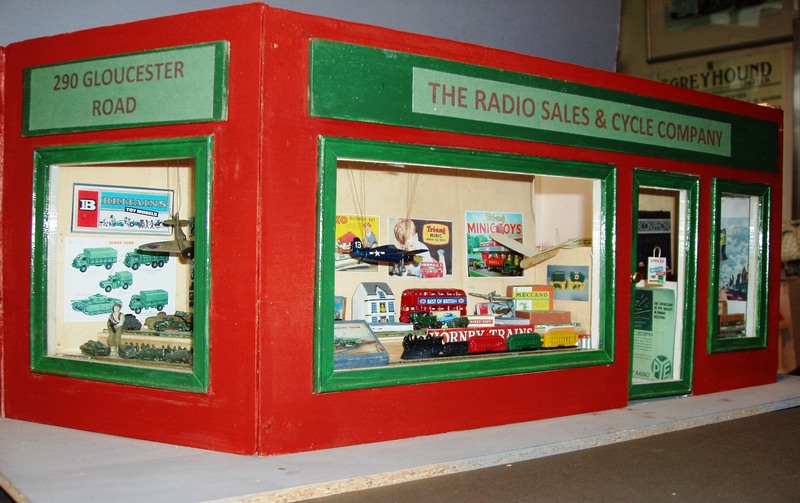 Its windows were full of model aircraft, Hornby trains, Dinky toys, Bayco building kits, etc etc. When we entered the shop smelled of dope and balsa wood. 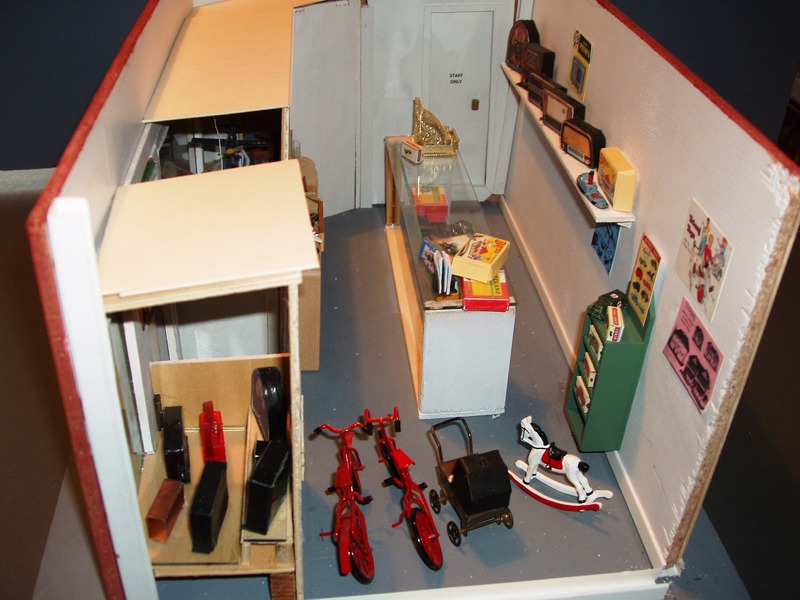 A wonderful place where I purchased kits to make flying gliders. Moving south to 267 I remember the Green Bird library which my Mum helped me join and where I borrowed my first library books. On Pigsty Hill was a big private house (237) where the Surgeries of Dr. Heron and Dr. Maxwell and others were situated. I suffered from earache as a child and Dr. Maxwell was the one who seemed eventually to cure me. Then just below St Michaels and all Angels Church on the corner were the premises of the Estate Agent; John Saywell (235) The big house, which had once been a bank, had quite a forecourt in front of it which was very useful to us boys when we reached the age of making "Dandy carts" from boards and pram wheels. We would come screaming down the short hill of Brynland Avenue from Morley Square at speed straight towards the main road and then turn at the last minute and skid to a halt in front of John Saywell. Wonderful fun !! Moving south again, in about 1959/60 period there was a firm called Trident Lambrettas. Here , as a student at Redland College I purchased my first motor scooter. 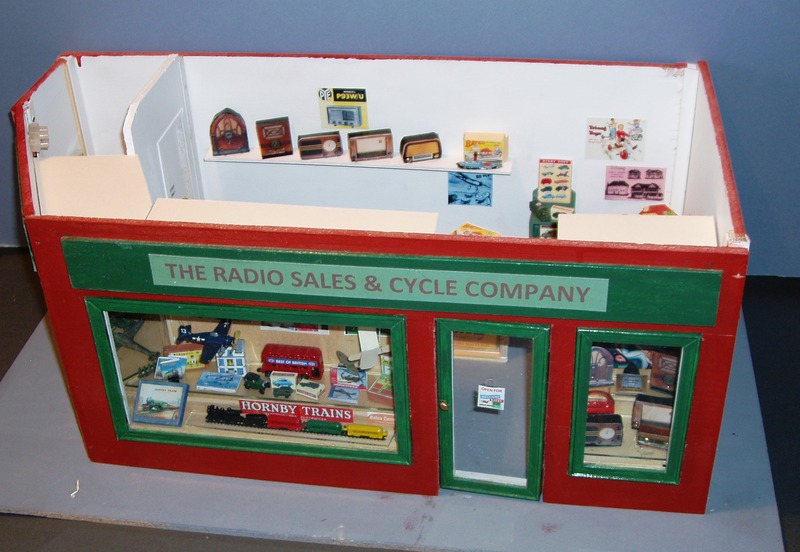 In the same block of shops on the corner of Princes Place during the war years whilst I was very young was abig toyshop. My Welsh Grandmother took me here in about 1943 to get me something and because there was little metal about I finished up choosing a small toy coach which turned out to be made of plaster. It wasn’t long before all the paint came off the corners and my toy gradually developed into a block of chalk! South of here again and virtually opposite the portrait photographer’s house was a wonderful junk shop run by a Mr. Anderson. I was an avid collector of "antiques" from an early age and my mother never knew when I would come home with a stuffed squirrel in a glass case or items of Goss pottery or another piece of furniture for my bedroom. Just below Andersons on the corner of Somerville Road was Hodder’s the Chemist.(203). When I was about twelve I had a friend who looked older than his years and we developed an interest in chemistry. Hodder’s sold all the things we needed – test tubes, glass tubing and retorts and also chemicals! It was not long before we discovered how to make gunpowder and could buy our ingredients with no trouble at all from obliging Hodder’s. But the most amazing thing, looking back from today, is that they did not question Mike’s age when he wanted to buy bottles of acid and allowed him to sign the "poison book". Thus we had a cupboard in my bedroom full of bottles of Hydrochloric and sulphuric acid which quietly burned the corks away. My mother eventually ordered a clear out of the hidden hoard after we blew some bricks out of the back garden wall and Mike burned the palm of his hand holding a homemade firework. Crossing Somerville Road, going south was The Robin Hood’s Retreat". (197) . I had no interest in pubs but this one was notable because my father was Captain of the darts team there. Crossing Bolton Road was Halfords.(195). Here my first new bicycle was purchased for me after much nagging of my poor parents. A little further down the road, opposite Bristol North Baths was J.H. Mills the grocer. (173). Here I started work at the age of fifteen, having walked out of The Bristol Central Secondary Commercial School, for which I had passed an entry exam at the age of thirteen but was very unhappy there. I also remember, still walking south, The Oxford Food Stores Pet shop, Woolworths, Rayward’s Biscuits and Edward Cook’s Bookshop. On the other side of the road going north – on Pigsty Hill I remember J Stone Hodges with all its drawers of every type of handle and screw and smelling of varnish and paints, and at the top of the hill Rupp’s Pies which it was always difficult to pass because of the delicious smells emanating from their bakery. Altogether I look back on my childhood in Bishopston as privileged place to grow up and the Gloucester Road played a major part. Today at seventy four years of age I often come back and walk the road from the Premier Cinema down to Zetland Road. I remain glad that the road remains so individual and lively but I yearn for the old days and the old shops. I think your project is great. I do hope that these memories may be helpful and would be pleased to assist more if I can. Note; During my two years from 1959 to 1961 training as teacher at Redland College I did six weeks teaching practice at Bishop Road School. Before the practice we were given an assignment to study the environment of the children we would teach lived in. I still have the study and attach some of the photographs which I took to illustrate it.